switching capacity. The switches deliver wire-speed switching performance on all Gigabit ports, taking full advantage of existing high-performance PCs by significantly improving the responsiveness of applications and file transfer times. The IEEE 802.1w Rapid Spanning Tree Protocol provides a loop-free network and redundant links to the core network with rapid convergence, ensuring a faster recovery from failed links and enhancing overall network stability and reliability. The IEEE 802.1s Multiple Spanning Tree Protocol runs STP per VLAN base, providing Layer 2 load sharing on redundant links for up to 32 instances. The ECS4620 Series supports IEEE 802.3ad Link Aggregation Control Protocol (LACP). It increases bandwidth by automatically aggregating several physical links together as a logical trunk and offers load balancing and fault tolerance for uplink connections. The ECS4620 Series supports G.8032 Ethernet Ring Protection Switching, with the ability for the network to detect and recover from incidents without impacting users, meeting the most demanding quality and availability requirements. Rapid recovery time when problems do occur is as low as 50 msec. performance for data, voice, and video traffic at wire speed. Eight egress queues per port enable differentiated management of up to eight traffic types through the switch. Traffic is prioritized according to 802.1p and DSCP to provide optimal performance for real-time applications. Weighted Round Robin (WRR) and strict priority ensure differential prioritization of packet flows and avoid congestion of ingress and egress queues. Asymmetric bidirectional rate-limiting, per port or per traffic class, preserves network bandwidth and allows maximum control of network resources. The ECS4620 Series supports Three Color Marker and Policing Single rate: Committed Information Rate (CIR) Two rate: CIR + Peak Information Rate (PIR) Traffic Policing: Which drop or remark the priority tags of packets when they exceed burst size. Telnet and web access to the switch, providing secure network management. Private VLANs (traffic segmentation per port) isolates edge ports to ensure user privacy. DAI (Dynamic ARP Inspection) is a security feature that validates Address Resolution Protocol (ARP) packets in a network. DAI allows a network administrator to intercept, log, and discard ARP packets with invalid MAC-to-IP address bindings. 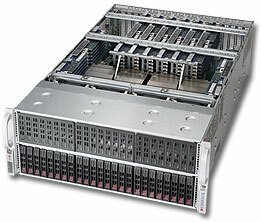 The ECS4620 Series supports hardware-based IPv4 routing for maximum performance. Routing protocols, such as RIP v1/v2, and static routes are supported. The Edge-Core ECS4620 Series is a family of high-performance Gigabit Ethernet Layer 3 switches featuring 28 or 52 ports; with 24 /48 10/100/1000BASE-T ports, 2 10G SFP+ ports, and one 10G dual port expansion slot. 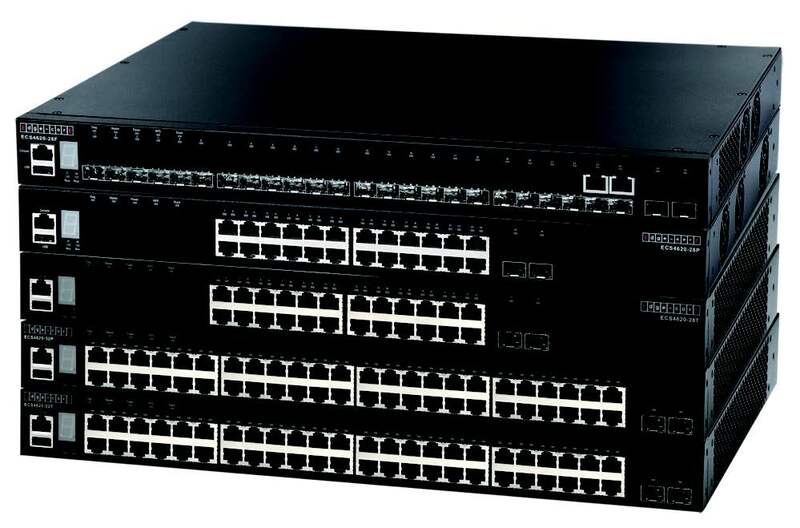 The switches are ideal for high-performance server aggregations, such as enterprise data centers, where they can connect high-end or network-attached files servers over fiber ports. They can also be deployed as a backbone upgrade, or to provide Gigabit–to-the-desktop for power users. These switches are packed with features and are a cost-effective solution that bring continuous availability, enhanced security, andadvanced QoS to the network edge, while maintaining simplicity of management.